East Clare fiddle legend Paddy Canny, who passed away this summer (2008), greatly influenced younger fiddle players like his nephew Martin Hayes and London-born Kevin Burke, to name just two. 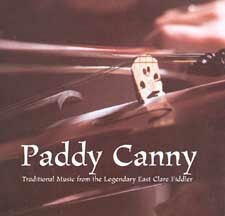 On this CD recorded between 1995 and 1997, Canny performed a variety of tunes, not all associated with Clare, as well as some compositions by Canny himself, Paddy O'Brien, Sean Ryan, and Paddy Kelly. All of them, however, are given the Canny treatment--listen to his version of "The Rights of Man" in D, mostly major, for instance. Because of Canny's old-style intonation, Eugene Kelly's accompaniments on piano and guitar, although well played and understated, sounds somewhat incongruous to my ear--somehow, the piano seems to be the better fit. Although one might wish that the album were made twenty years earlier, at this time we should be thankful that it was made at all..